"Total Recall," some wishful thinking from Mike Quinn and some truly awful wardrobe recommendations! Previous story Running Types: Are You One of These Guys? Next story Month 1 Muscle & Fitness Male Model Online Contest Winners! With the (completely unnecessary) Total Recall remake lurking about a month away, we thought it appropriate to look back on the glorious original, and, more specifically,how we covered it right here in the pages of M&F. 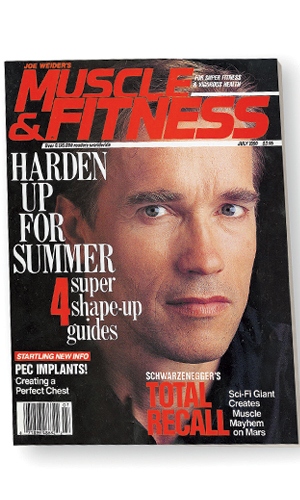 The Arnold cover story for our July 1990 issue is a preview of the film, teasing some of the more memorable bits—the battle with Sharon Stone, the mutant sleaze bar, and, of course, Arnold’s bulging eyeballs.